If you follow me on Instagram or Snapchat (jessfuel), you’ve probably seen my pretty little kitty a time or two. I’m kind of obsessed. And she’s even made a few appearances on the blog lately: here, here and here! But Cali’s not the only furbaby at home, and someone else was getting a little jealous of all the time his little sister was spending in the spotlight. 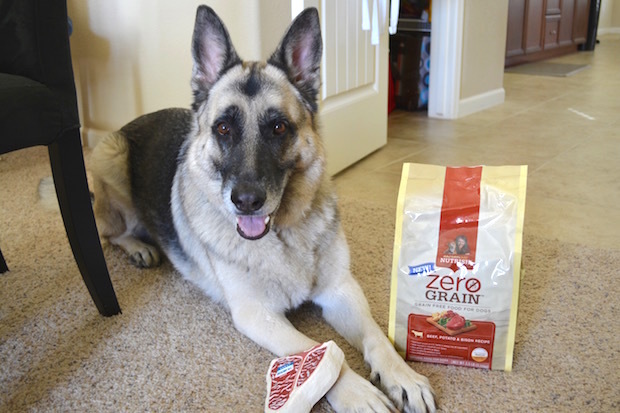 So when Kaiser got the opportunity to sample some Rachael Ray Nutrish Zero Grain Beef with Bison Dry Dog Food and show his cute face on the blog, he was all about it. Big dogs can’t let stinkin’ cats have all the fun! 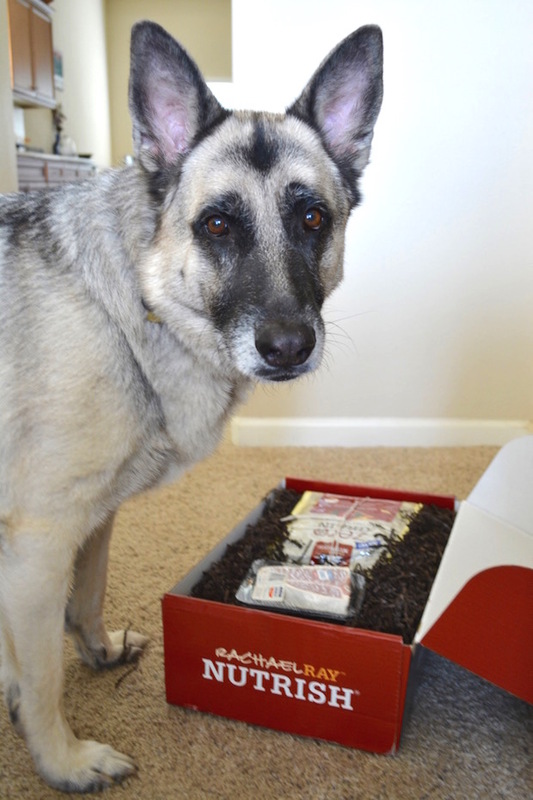 When Kaiser’s package arrived, he was soooo excited. Mostly because the doorbell rang. The doorbell is this crazed evil noise and the UPS man must be barked at until he is all the way down the street and out of sight. Kaiser is the friendliest dog I have ever met and wouldn’t hurt a fly, never mind a treat-wielding UPS man (yeah, that guy is smart), but man he does not like people coming to the door or ringing the doorbell. One time the poor FedEx man practically peed himself while running away after I opened the door with Kaiser at my side. He knocked over (and broke) one of my solar lights and just kept running and yelling “sorry!,” too scared to turn around and pick it up. It’s a little amusing, knowing what a softie the mutt really is. Once the package was safely inside and we were sure the UPS man was gone, it was time to investigate. Now, normally Kaiser is scared of boxes. This comes from his fear of guns (we took him shooting/hunting a few times when we lived in Mississippi and he literally ran away as fast as could), which turned into a fear of bubble wrap (because it sounds like guns), which he now associates with boxes. I swear, he’s really smart! But… maybe not cut out to be a K-9 cop. This box must have had some good scents going on, though, because Kaiser put on his brave face and sniffed the heck out of it. Since he’s lacking opposable thumbs, I helped him open the box and then the sniffing really ramped up. Yummy food and a toy? BEST DAY EVER!! Help me open this, Mom! 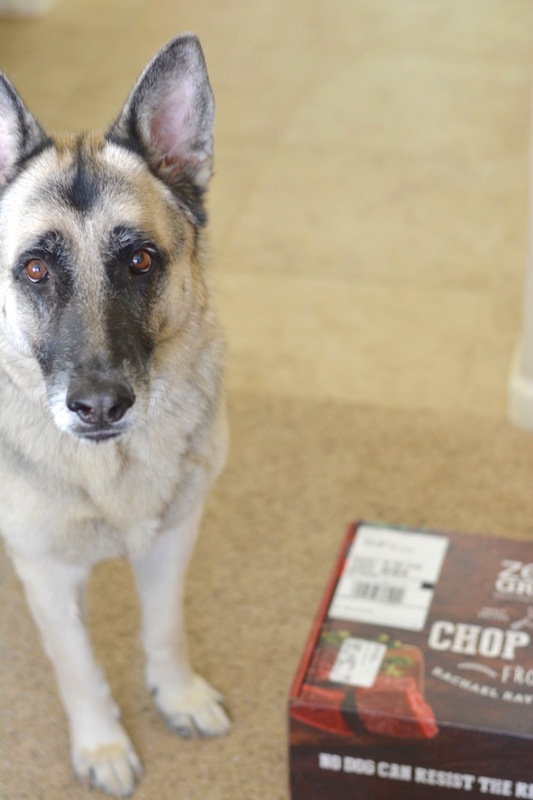 We tried the Nutrish food right away, but as always when changing your pet’s food, make sure you follow a transition plan so their systems can adjust to the new food. Slowly mix the new food with his or her other food over a five- to ten-day period until your pet is solely eating the new food. The first day, Kaiser gave an interested sniff and then dug right in. He loved it! Rachael Ray Nutrish Zero Grain Beef with Bison Recipe is made with simple, natural ingredients like real U.S. farm-raised beef, which is always the number one ingredient, combined with wholesome vegetables. And there are never any grains, glutens or fillers. Since our pets are family members, feeding them as well as we feed ourselves is really important! Sometimes I think Nick actually worries more about what he’s feeding Kaiser than what he’s feeding himself! To keep our mutt healthy, we feed him good quality food and take him on lots of walks and runs! He also likes to pester the cat, chase shadows, play in the sprinklers (he’s obsessed with biting at water) and get lots of love, especially from his dad. 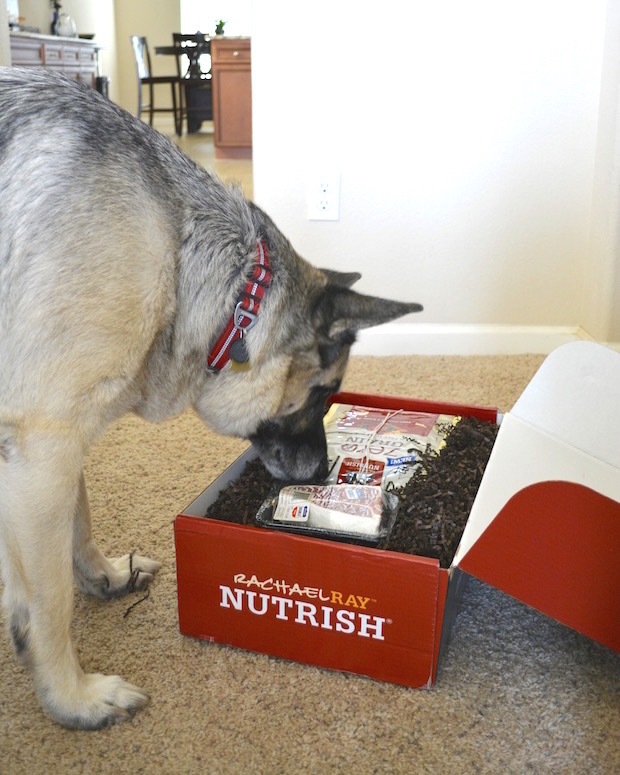 Besides being good for your pets, feeding them Nutrish can help save other animals, too! Rachael’s personal proceeds go to Rachael’s Rescue, a charity created to help shelter pets in need. This money has gone toward food, medical supplies and treatments for these unfortunate animals. We can definitely get behind helping other furbabies. 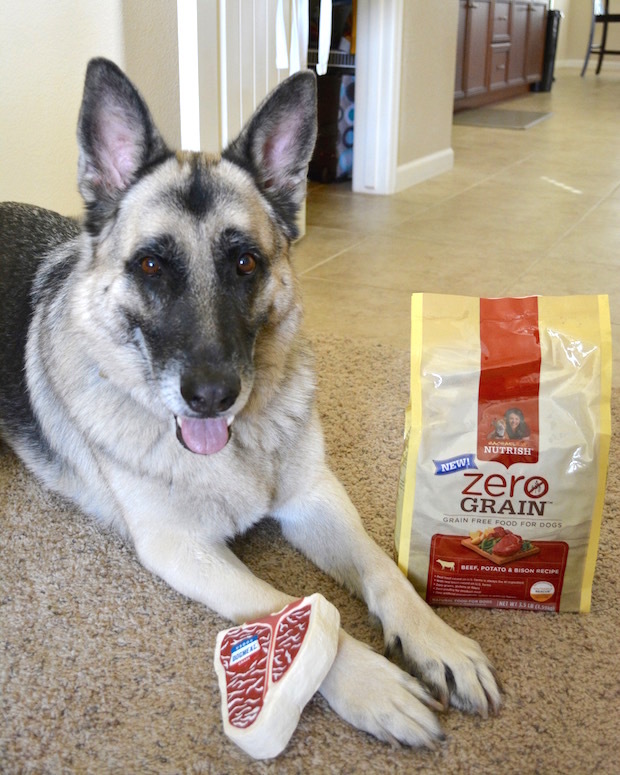 Get a coupon for $3 off Zero Grain pet food here! To keep up to date with all the latest Nutrish happenings (and see lots of cute pet pics), be sure to follow Nutrish on Facebook, Twitter and Instagram! He is sooo cute!!!! You are like me, I have a kitty and a dog too! Dakota loved that beef and bison! I’m glad you did the transition slow! That always scares me when I see people trying out their dog food samples. It can be so upsetting to their tummies if not done right! That’s really awesome that some of the proceeds go to charity. As a shelter dog activist, I LOVE that. Me too, Miranda!! It’s always great to give back– especially to furry ones in need! Oh my gosh Kaiser is adorable! What a cutie! Awww such a heartthrob!! I bet he must be happy with all the goodies!